James J. Lepki was born on October 7, 1922 in Capreol Ontario. 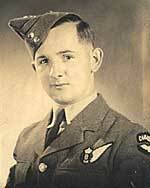 In January 1941 James joined the RCAF at the age of 19. After very extensive training in the RCAF he was posted to the RAF squadron # 578 in Burn, Yorkshire, England on December 22, 1944. Sergeant Lepki, the Canadian Bomb Aimer in a Halifax bomber found himself in a difficult situation on one of his missions. "As we neared the target, I wriggled into position over the bomb sight and in so doing, snagged the release valve on my Mae West, which, of course, did what it was supposed to do and promptly inflated, effectively trapping me into the cramped space and preventing me from continuing with the task ahead. I informed the pilot of my predicament and asked for assistance in extricating myself from the pneumatic straight jacket." "My friend, Jack Kisberg, our flight engineer, was duly dispatched to deflate the situation, while our gunners were alerted to keep a sharp look out for friendly and enemy aircraft while the pilot proceeded on a dummy run over the target, before going round again, this time, without encumbrance." Sergeant Lepki, describes another hitch. "We identified the target area without difficulty and commenced our run up in a fine style only to find, at the crucial time, that the mechanism operating the bomb doors had failed and that they were firmly shut." "Our unflappable pilot, Tony Horton, proceeded with the necessary dummy approach in the midst of friendly aircraft and considerable anti-aircraft ground fire. He then turned with the intention of making another attempt. All available eyes kept a keen look out for further trouble while our flight engineer, Jack Kisberg, assisted me to crank the doors open manually. This achieved, I resumed my position in the nose and was able to direct the pilot to the target, where our bomb load was finally and successfully discharged. We then turned for home each of us secretly saying our prayers." James Lepki lost many good friends in the war, including lads he went to school with. "It brings back a lot of sad memories. Of course I was there so I know myself what these boys went through. Stanley Gilbert Napier was killed in action April 12, 1942. John William Stephen was killed in action November 13, 1942. Gilbert Melbourne Orser was killed in action on March 6, 1945. Frank Joseph Jackison was killed in action on October 22, 1943." Many young Canadians such as Jimmy Lepki, have fought and many have given their life in wars around the world. We should remember that their sacrifices have given us the freedom that we have today. Let us all take time to remember our war veterans.